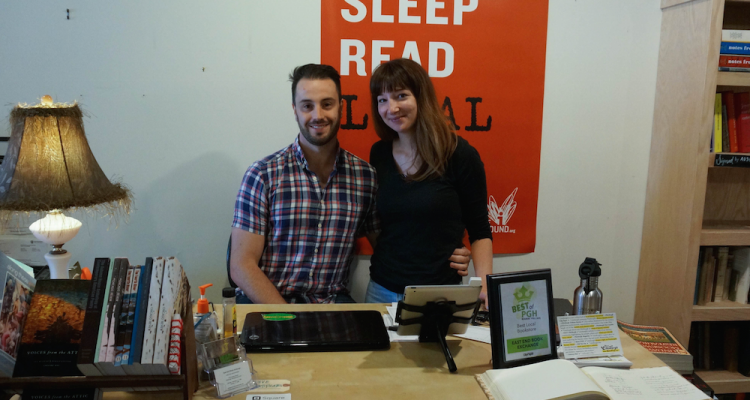 Adlai and Jill Yeomans, new owners of the East End Book Exchange in Bloomfield. East End Book Exchange, located at 4754 Liberty Avenue in Bloomfield, welcomed its new owners on June 1st. Jill and Adlai Yeomans bought the store and this fall they will be making changes, such as stocking new books in addition to used, expanding the children’s inventory and installing new shelving. Currently the store carries a wide range of used books in a variety of genres including classic and contemporary fiction, history, philosophy, travel, cooking, and children’s literature. 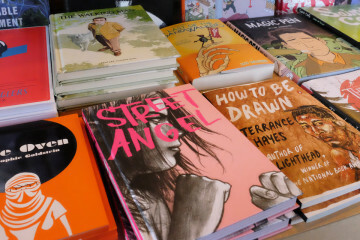 The Yeomans will slowly build up the selection of new books in the store and also substantially expand their programming, aiming to attract all ages. “We really enjoy learning about wonderful authors and publishers that don’t get a lot of exposure, so one of our goals is to showcase them,” says Adlai. For now, they are getting to know their customers, the loyal readers who came in—often weekly, sometimes daily—when Lesley Rains owned the shop. 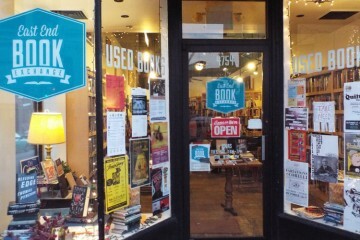 Rains put the business up for sale so she could take over as manager of the City of Asylum at Alphabet City bookstore. The Yeomans, who met in 2009 at Hachette Book Group in New York City, have extensive publishing experience, including Jill’s work as an author of a young adult series with James Patterson. With books, “we have done everything there is to do,” says Adlai. On a recent Tuesday morning, two Pitt students browse and talk about Shakespeare while Adlai hurries over to open the door for a mom with a stroller and later an older woman with a walker. “Is Lesley here?” asks the woman. Jill explains that she and Adlai have taken over and says brightly, “You must be the mystery lover! Lesley told me about you.” The women settle in to chat while Adlai helps a customer at the register. “We want to be a place where people can come in and be introduced to an author they may not have heard of before,” says Adlai. “That’s the exciting thing about moving toward more new titles.” Through direct publishing connections, the couple plans to bring in authors they know about who may not have been planning to make a stop in Pittsburgh. In that way, the Yeomans are looking forward to not only expanding the store and sharing their passion for books with Pittsburgh but also sharing Pittsburgh with the authors.